The Rose Garden of Florence is a place of extreme beauty, widely considered to be one of the most beautiful panoramic gardens of the entire city. 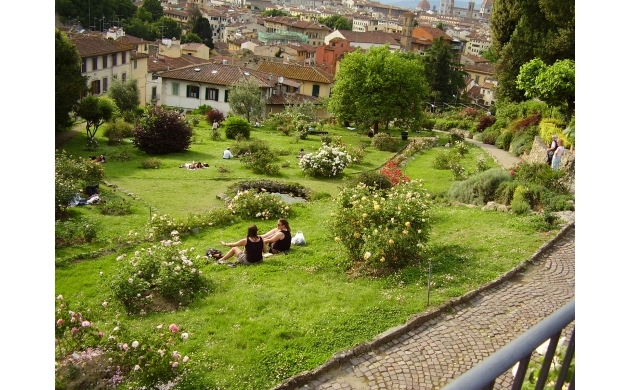 After having visited Piazzale Michelangelo it is a near requirement to pass through this garden before returning to the center of the city. Reaching it is easy: from the Piazzale, looking at Florence below, it is as simple as taking the stairs on the left-hand side, in this way arriving at the access point for this wonderful spot. The Rose Garden is visited by tourists who wish to see the over one thousand varieties of roses of every color. But above all, the garden is visited by photographers and botanists who want to capture or study the nearly 400 varieties of the more ancient roses, some of which date to the 1500s, in the fear that one day these magnificent varieties will disappear entirely from the earth. Some of the rose varietals kept inside the garden also flower in the autumn period - an element which makes this garden a joy to visit in every season (except perhaps for the middle of winter). In the beginning, this garden was part of a villa that belonged to Philippine priests, up until the point when the area was renovated as part of the construction of the terraces of Attilio Pucci. Pucci had a collection of roses, and it was his idea to plant them here, giving new life to his collection. In 1865, when the city of Florence was named the capital by the King of Italy, the architect Giuseppe Poggi (who also designed Piazzale Michelangelo) was commissioned to redesign the southern part of Florence, known as Oltrarno (since it is found over the Arno river). In addition to organizing the garden, Giuseppe Poggi was also responsible for creating the irrigation and plumbing system that would sustain it. To achieve this, Poggi built a massive cistern at the highest point of Piazzale Michelangelo, capable of capturing rainwater and conducting it through a vast network of piping to be collected in large tubs. The garden was inaugurated only 30 years later, during the Festival of Arts and Flowers that the Società di Belli Arti and the Italian horticultural society held jointly in the month of May. 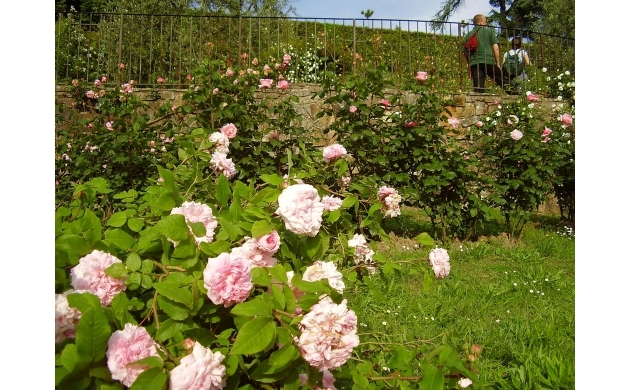 Carlo Landini, a gardener who specialized in the cultivation of roses, was assigned to maintain the garden. 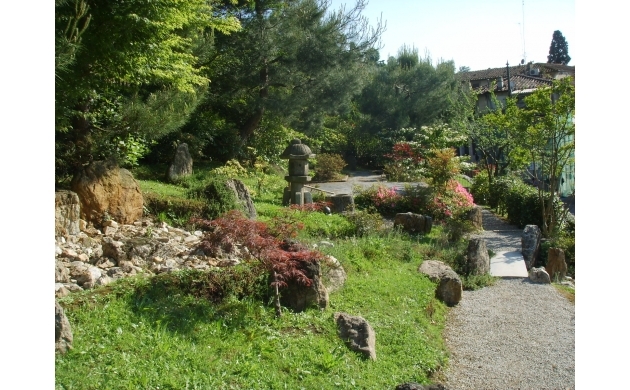 In 1998, the garden was further enriched by the addition of a Japanese garden, called Shorai, which was built by the Japanese architect Yasuo Kitayama and donated to Florence by her twin city Kyoto (from the Zen temple Kodai-Ji). Last but not least, an important addition to this park were the 12 sculptures of the sculptor Jean-Michel Folon, donated to the city of Florence by his widow soon after his premature death in 2005. 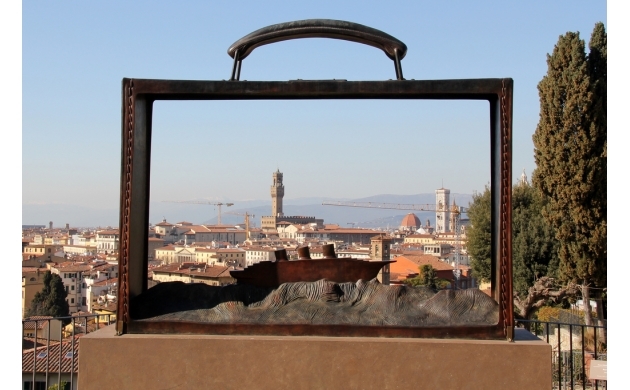 Among these works, perhaps the most impressive is the "empty suitcase" which frames within it the spectacular - and always new - panoramic view of Florence. So, if you've just visited Piazzale Michelangelo or the Basilica of San Miniato, you can leave the hill by passing through this extremely suggestive environment. A garden much more intimate and hidden than the much-visited Boboli, and therefore perfect for a romantic date.